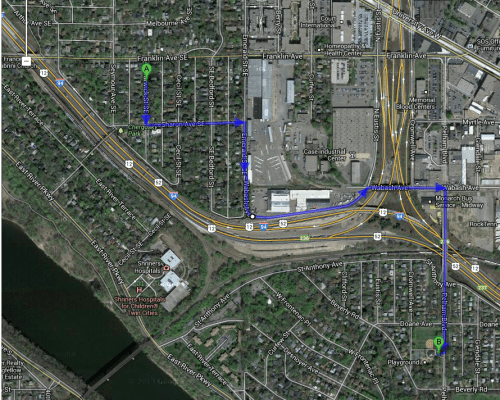 Let me tell you about two trips from my home, in Minneapolis, just three blocks from the St. Paul city line.The first was with my kids to use the Desnoyer Park Playground, which is (sadly) nicer than any walkable playground nearby in Minneapolis. The kids ask for it by name. Google Maps places it 1.1 miles away by walking. Normally we drive (it might be a stop on part of a longer shopping trip, and is a good place for the kids to get their “yahs” out), but on one of the few pleasant weekend days of 2013, we walked. We used this route (shown below). 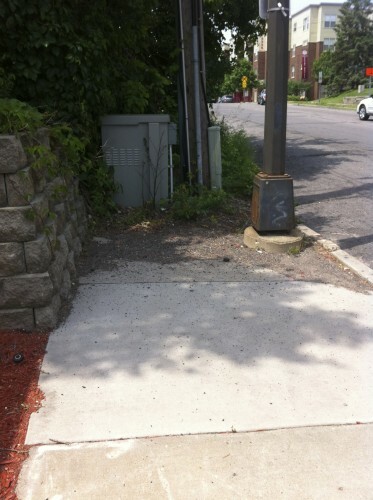 It was filled with broken glass, uneven railroad tracks, and lack of sidewalks. It’s somewhat industrial, so its lack of aesthetics was not surprising, but it is hard to see the nature of the unwalkability from the car. The walk will not be repeated. The reason for using this path is that the next shortest alternative crossed the Mn280 on and off-ramps, which were highly undesirable to walk on (see next paragraph). We walked back via East River Parkway, but the distance (1.3 miles) while seemingly not much different, is both 0.5 miles longer round trip, more complex, and hillier. Even East River Parkway does not have sidewalks on both sides of the road, though the grassy strip is ok in the late spring. Ideally there would be a pedestrian crossing of I-94 at Emerald or Bedford to St. Anthony Avenue, but I suspect pedestrian demand is too low to warrant such a crossing (certainly it would not be anyone’s highest priority). I don’t have an accurate map of all the sidewalks in the metro area (if anyone does, please share), but clearly the network is less complete than the automobile street network. One could look on the bright side, and say this just means the city is trying to implementshared spaces, just unevenly, but that implies a progressive intentionality that I think we know is lacking. 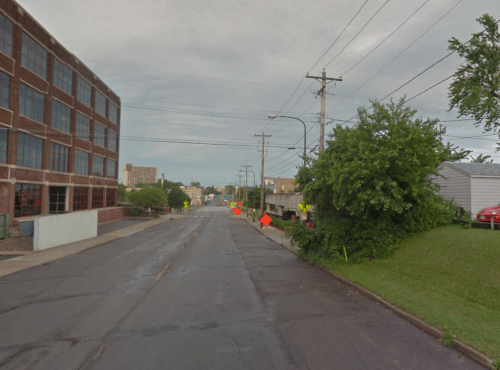 My conclusion from this is that (1) St. Paul hates (PC edit) is strongly indifferent to the bipedal mobility needs of the residents of Minneapolis and does not want any inter-municipal pedestrian travel, and/or (2) St. Paul doesn’t much like pedestrians.